Anyone who has experienced acute or sudden pain in response to an accident or injury knows that it can be all consuming. The injured area is protected by altering our movements, we lean away from the site of injury. Thomas Hanna called this the “trauma reflex”[i] a built-in response of the nervous system that effectively splints the area through contraction of the surrounding muscles. This gives the injury time to heal. The ‘trauma reflex’ is an important and necessary process, but what we often see is that once the injury heals, unless the pattern is consciously released, traces of it remain. You can probably call to mind friends or acquaintances that move stiffly or in a manner that suggests the holding of an old injury. This can mean that pain or discomfort is not fully released and can become habituated at the level of the brain, creating instability and a vulnerability to future injury or other health issues. A large majority of the people who come to see Alexander Technique teachers are looking to resolve long-term pain and discomfort that other modalities have helped, but not resolved. Whilst acute injuries are well served by medical and physical therapy, the Alexander Technique has a unique offering which supports individuals to understand their whole body movement patterns. Through a development of a conscious awareness they learn to recognise that there is more to healing injuries than attending to the site of pain. Lower back pain can be exacerbated by a habit of holding on at the ankles and locking the knees back. The pelvis may twist away from the injured area. There is often a misalignment of the pelvis and the head, which can compress the spine causing a shortening and contraction the whole way through the body. Alexander Technique teachers know that for the brain and body to undo unnecessary levels of holding a safe and calm environment is paramount. In this environment the nervous system can begin to relax its grip on over-contracted muscles and compressed joints. This also allows breath the space to begin to move more efficiently, further unlocking painful and contracted musculature. Working with students on the table where they no longer have to ‘hold’ themselves up in gravity, they can learn to more effectively release excess tension and tightening. This table work can also reveal old, and often unconscious, patterns of activating areas of the body that are unnecessary for the task. The teacher’s hands can be used effectively to guide them to bring a conscious awareness to the unnecessary muscular activity and to re-train the brain and body for easier and more effective movement. Sometimes thoughts and beliefs about certain movements are revealed as people speak about how they perceive a movement they are engaging with. These too can be investigated in a supportive and exploratory environment which may lead them to understand that their conception is inaccurate or actually adding to their retention of the painful pattern. My own experience as a student of the Technique and now as a teacher bears witness to the incredible power of learning to consciously understand how we move and how we think about movement. With the supportive guidance of a teacher we can learn to release excess tension and contraction throughout the whole body and mind. We can experience greater ease, expansiveness and more efficient movement. Painful patterns are whole body patterns; to undo them requires attention to the whole. They can be unwound and we can once again embrace a stronger sense of wellbeing and freedom. Nice never read about this. Definitely going to talk a about this with my pain doctor. Would you like to move more freely? Would you like to explore dance or join a dance class but feel self-conscious, shy or unsure of your ability to move with rhythm? Are you participating in a dance class and would like to move with greater ease? If so, this workshop is for you. It will gently lead you through an exploration of a number of movement and dance practices to re-connect with your natural capacity to move with ease and joy. 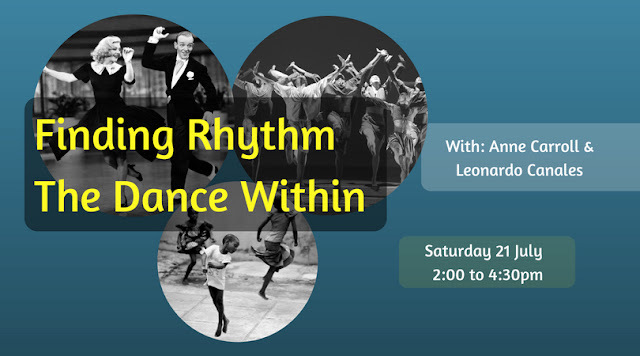 The workshop will use the principles of the Alexander Technique to explore movement and find your unique rhythm. You will develop your awareness of yourself in movement, the ability to move alone and with others in an easeful and expressive way. Fear can be our friend ­– alerting us to potential threats to our wellbeing and safety. It orients us to information around us or within and prepares us to respond. However, fear can also become a habitual and largely unconscious and therefore unquestioned, learnt response to certain stimuli. Each time we encounter a particular person or situation which reminds our brain of an earlier experience, we respond with fear and/or anxiety. We may be left wondering why we often feel tense, tired or stressed. Fear creates a contraction throughout our whole system – a tightening into our centre away from the source of concern. Our breath is held tight and its flow restricted and we may find ourselves living in a heightened state of tension much of the time. In this state our muscular system becomes less elastic and less available to move in a way that supports us with ease and efficiency. Hi my name is Anne. I love to read, to learn and to be part of a creative community. After a number of dark years living with Chronic Pain I set out on a journey to find ways to unwind the many interwoven strands of the pain puzzle. I have always been an avid reader and after a number of years of using mainstream offerings for Chronic Pain I discovered the area of Somatics. I began exploring a number of somatic practices in the educational area and a new way of living opened up. My hunger for a different approach led me to explore the Feldenkrais Method and to train and qualify as an Alexander Technique Teacher. I also became fascinated by neuroscience and its many new insights, how they relate to the field of Chronic Pain, Somatics and to my work as a movement educator. I have been practicing mindfulness meditation for about seven years and began exploring the Alexander Technique about six months later. These two practices provide me with powerful tools to live a more considered, constructive and joyful life. This blog is an exploration of some of these themes.